Flat For Sale in London for Asking Price £699,995. Set behind a gated walled courtyard is this brick built Grade II listed building with stucco detailing which dates from circa 1850. 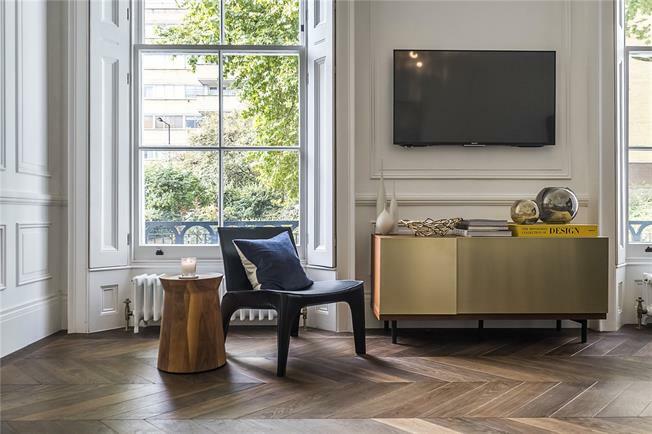 Having been meticulously refurbished to an extremely high standard by the current owners, this stunning apartment offers high specification modern living with period charm. The open plan kitchen / reception room is filled with an abundance of natural light from the two SW facing sash windows. High ceilings of 12'6 (3.8m), traditional cornice and panel detailing and sleek chevron wood flooring complete the sophisticated look. A remote controlled electronic mechanism opens the concealed bed, with hidden wardrobe storage space within the panelling. Further benefits include hallway utility cupboard and storage, access to the well maintained communal gardens and a share of the freehold interest. Porchester Terrace North is a well connected area of Bayswater, conveniently located for fashionable districts such as Westbourne Grove and Notting Hill as well as the comprehensive shopping facilities of Queensway and Bayswater including Whiteleys Shopping Centre. Nearby transport links include Bayswater (Circle and District lines), Royal Oak (Hammersmith and City lines), Queensway (Central line) and Paddington Station (Bakerloo, Hammersmith & City, Circle, District lines, National Rail Services, Heathrow Express and CrossRail due 2018). For motorists the A40 is easily accessible. Service Charges: The vendors advise annual charges are circa £2,000 (TBC).